But while it sounds like a script pitch, this actually happened in the fall of 2011, with Bacillus anthracis, as the causative agent of anthrax, as the starring villain. There was one very important change to the storyline though. Thanks to the efforts of the laboratorians at Lake Region Healthcare in Fergus Falls, Minnesota, and the Minnesota Department of Health Laboratory Response Network (LRN) staff, the mystery bug was identified in time to provide treatment, and the patient is alive and well today. Maureen Sullivan of the Minnesota Public Health Laboratory told us the story of the legwork that went in on the laboratory side, and it would definitely make for a pretty good movie! First, a word on the LRN. The LRN was developed in 1999 by the Centers for Disease Control, APHL, the Federal Bureau of Investigation (FBI) and the Department of Defense. Today, there are two main arms of the LRN: chemical and biological threats preparedness and response (LRN-C and LRN-B), which provide a strong, unified system of laboratories that can respond to any threat. There are standard protocols for everything, and regular trainings to keep everyone up-to-speed. In the LRN-B, Sentinel Level laboratories like the Lake Region Healthcare Laboratory can rely on reference laboratories such as the Minnesota Public Health Laboratory, and the Minnesota Public Health Laboratory, in turn, can call on resources within the CDC. Further, the Minnesota Public Health Laboratory can leverage partnerships with the local law enforcement, FBI and the National Guard Civil Support Team. 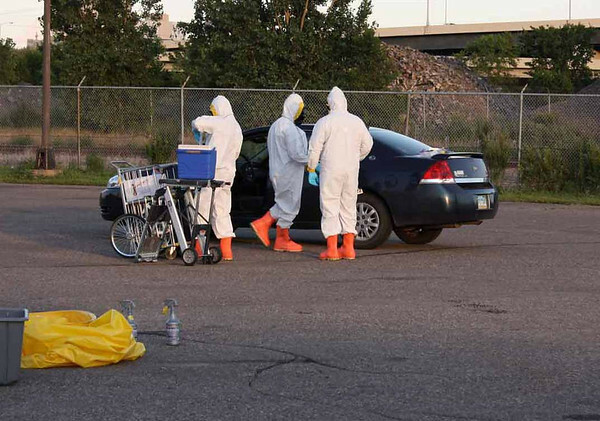 From the first culture to the final treatment, the Minnesota anthrax case was a perfect illustration of what dedicated laboratory and first responder professionals can do with the strength of the LRN behind them. Back to our story. The patient in question was a 61-year-old Florida man who had been driving through the northern plains states for the past few weeks with his wife, taking in your standard tourist attractions and enjoying the scenery. (Can’t you picture the opening montage of our movie?) He had a previous history of pneumonitis and had been exposed to Agent Orange in the Vietnam War, but was otherwise healthy. When he arrived at Lake Region Healthcare on a Thursday afternoon, there wasn’t anything to suggest that he might be infected with a deadly biological agent, so the hospital began its standard protocol for flu-like symptoms and sent blood cultures to the laboratory. These cultures were examined that Friday morning and, after finding all four to be positive, the laboratory technician followed LRN sentinel protocols and plated all four to watch for growth. Normally samples like these would have been checked again at about noon on Saturday, but the laboratory technician was suspicious and made a point to look at them again later Friday afternoon. Cue the ominous music and enter the Minnesota Public Health Laboratory, an LRN Reference Lab, at camera left, because those plates had growth! Meanwhile, the patient’s condition had deteriorated. On Sunday, he was loaded into a medevac helicopter and sent south to a larger hospital for treatment. Despite a nail-biting collapse en route, doctors were able to stabilize him, and the following day a team from the CDC administered emergency treatment. It’s important to note that this treatment would not have happened without the positive B. anthracis identification from the Minnesota State Public Health Laboratory. That treatment, coupled with the early changes to the patient’s antibiotic regimen after the positive identification, is likely the reason the patient recovered completely. Like any good movie, this story leaves a few questions behind. 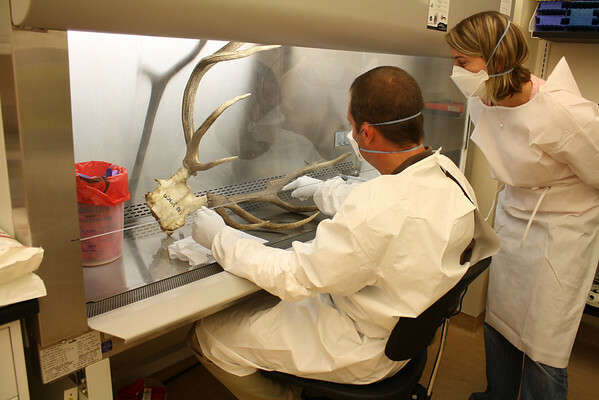 First, where did the anthrax come from? While the movie version of this story would probably end with some hint at nefarious origins in order to create a sequel, the truth is it was probably a complete coincidence. Anthrax is found naturally in all seven continents and lies dormant in soil for hundreds of years. The spores can reactivate when they are kicked up and inhaled, commonly by grazing animals. Our patient had spent some time on his road trip collecting rocks from riverbeds, and at one point drove past a large herd of grazing buffalo. It’s probable that he inhaled some spores (and it would only take one) in one of these locations, but we will truly never know. You may also be wondering why the patient’s wife didn’t get sick, despite being in all the same places and presumably getting the same exposures. It’s possible that the patient’s history of lung problems might have made him more susceptible, but again, there is no way to know. She may have just been very lucky. In conclusion, Contagion 2: LRN in Action. Get the popcorn! *Speaking of Contagion, my friends in Minnesota would probably like me to point out that this case study does an awesome job of refuting the movie Contagion’s very unflattering portrayal of Minnesota public health and emergency response systems. Despite what Steven Soderbergh may have you believe, when trouble arrives in real life, Minnesota is on its game! I live next to a Buffalo farm. Should I be concerned they might kick up some Anthrax spores and the wind will carry them my way? vigorously to ensure it maintains stability. look as if they belong on a Navy destroyer. Standard kids beds The storage space can encourage your child to make sure whether a left-orientation or right-orientation will suit your needs.